Rogue One (also known as Rogue One: A Star Wars Story) is a 2016 American epic space opera film directed by Gareth Edwards. The screenplay by Chris Weitz and Tony Gilroy is from a story by John Knoll and Gary Whitta. It was produced by Lucasfilm and distributed by Walt Disney Studios Motion Pictures. It is the first installment of the Star Wars anthology series, set just before the events of A New Hope, and follows a group of rebels on a mission to steal the plans for the Death Star, the Galactic Empire’s superweapon. The cast includes Felicity Jones, Diego Luna, Ben Mendelsohn, Donnie Yen, Mads Mikkelsen, Alan Tudyk, Riz Ahmed, Jiang Wen, and Forest Whitaker. Based on an idea first pitched by Knoll, ten years before it entered development, the film was made to be different in tone and style from the traditional Star Wars films, including omitting the customary opening crawl and transitional screen wipes. Principal photography on the film began at Elstree Studios near London in early August 2015 and wrapped in February 2016. The film then went through extensive reshoots directed by Gilroy in mid-2016. The film premiered in Los Angeles on December 10, 2016, and was released in the United States on December 16. The film received positive reviews and praise for its acting, action sequences, musical score, visual effects, and darker tone, but received criticism for its underdeveloped characters and digital recreation of actors from the original trilogy. 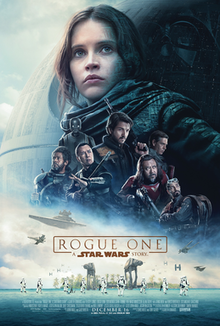 The film has grossed over $1 billion worldwide, making it the 27th highest-grossing film of all-time, the second highest-grossing film of 2016, and the third highest-grossing film in the Star Wars franchise. It received two Academy Awards nominations for Best Sound Mixing and Best Visual Effects.